And the bullets were made of lead, lead, lead. And the bullet went right through its head, head, head. There was once a little man named Jimson, who had stopped growing when he was a boy, and never started again. So, although he was old enough to be a man he was hardly big enough, and had he not owned a bald head and gray whiskers you would certainly have taken him for a boy whenever you saw him. This little man was very sorry he was not bigger, and if you wanted to make him angry you had but to call attention to his size. He dressed just as big men do, and wore a silk hat and a long-tailed coat when he went to church, and a cap and top-boots when he rode horseback. He walked with a little cane and had a little umbrella made to carry when it rained. 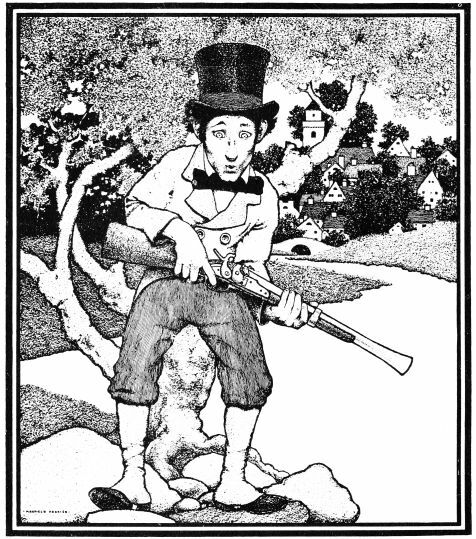 In fact, whatever other men did this little man was anxious to do also, and so it happened that when the hunting season came around, and all the men began to get their guns ready to hunt for snipe and duck, Mr. Jimson also had a little gun made, and determined to use it as well as any of them. "Jimson, you 'd better use bullets made of bread, and then you won't hurt anything." "Nonsense, Joan," replied the little man, "I shall have bullets made of lead, just as other men do, and every duck I see I shall shoot and bring home to you." "I 'm afraid you won't kill many," said Joan. But the little man believed he could shoot with the best of them, so the next morning he got up early and took his little gun and started down to the brook to hunt for duck. It was scarcely daybreak when he arrived at the brook, and the sun had not yet peeped over the eastern hill-tops, but no duck appeared anywhere in sight, although Mr. Jimson knew this was the right time of day for shooting them. So he sat down beside the brook and begun watching, and before he knew it he had fallen fast asleep. By and by he was awakened by a peculiar noise. "Quack, quack, quack!" sounded in his ears; and looking up he saw a pretty little duck swimming in the brook and popping its head under the water in search of something to eat. The duck belonged to Johnny Sprigg, who lived a little way down the brook, but the little man did not know this. He thought it was a wild duck, so he stood up and carefully took aim. "I 'm afraid I can't hit it from here," he thought, "so I 'll just step upon that big stone in the brook, and shoot from there." So he stepped out upon the stone, and took aim at the duck again, and fired the gun. The next minute the little man had tumbled head over heels into the water, and he nearly drowned before he could scramble out again; for, not being used to shooting, the gun had kicked, or recoiled, and had knocked him off the round stone where he had been standing. When he had succeeded in reaching the bank he was overjoyed to see that he had shot the duck, which lay dead upon the water a short distance away. The little man got a long stick, and, reaching it out, drew the dead duck to the bank. Then he started joyfully homeward to show the prize to his wife. "There, Joan," he said, as he entered the house, "is a nice little duck for our dinner. Do you now think your husband cannot shoot?" "But there 's only one duck," remarked his wife, "and it 's very small. Can't you go and shoot another? Then we shall have enough for dinner." "Yes, of course I can shoot another," said the little man, proudly; "you make a fire and get the pot boiling, and I 'll go for another duck." "You 'd better shoot a drake this time," said Joan, "for drakes are bigger." She started to make the fire, and the little man took his gun and went to the brook; but not a duck did he see, nor drake neither, and so he was forced to come home without any game. "There 's no use cooking one duck," said his wife, "so we 'll have pork and beans for dinner and I 'll hang the little duck in the shed. Perhaps you 'll be able to shoot a drake to-morrow, and then we 'll cook them both together." So they had pork and beans, to the great disappointment of Mr. Jimson, who had expected to eat duck instead; and after dinner the little man lay down to take a nap while his wife went out to tell the neighbors what a great hunter he was. And tried for to shoot the drake, drake, drake. "There 's no use putting it into the paper," exclaimed the little man, much provoked, "and Mr. Brayer, the editor, is probably jealous because he himself cannot shoot a gun. Perhaps people think I cannot shoot a drake, but I 'll show them to-morrow that I can!" "What does a drake look like, my love?" "Why," she replied, "it 's much like a duck, only it has a curl on its tail and red on its wing." "All right," he answered, "I 'll bring you home a drake in a short time, and to-day we shall have something better for dinner than pork and beans." When he got to the brook there was nothing in sight, so he sat down on the bank to watch, and again fell fast asleep. Now Johnny Sprigg had missed his little duck, and knew some one had shot it; so he thought this morning he would go the brook and watch for the man who had killed the duck, and make him pay a good price for it. Johnny was a big man, whose head was very bald; therefore he wore a red curly wig to cover his baldness and make him look younger. When he got to the brook he saw no one about, and so he hid in a clump of bushes. After a time the little man woke up, and in looking around for the drake he saw Johnny's red wig sticking out of the top of the bushes. "That is surely the drake," he thought, "for I can see a curl and something red;" and the next minute "bang!" went the gun, and Johnny Sprigg gave a great yell and jumped out of the bushes. As for his beautiful wig, it was shot right off his head, and fell into the water of the brook a good ten yards away! "What are you trying to do?" he cried, shaking his fist at the little man. "Why, I was only shooting at the drake," replied Jimson; "and I hit it, too, for there it is in the water. "That 's my wig, sir!" said Johnny Sprigg, "and you shall pay for it, or I 'll have the law on you. Are you the man who shot the duck here yesterday morning?" "I am, sir," answered the little man, proud that he had shot something besides a wig. "Well, you shall pay for that also," said Mr. Sprigg; "for it belonged to me, and I 'll have the money or I 'll put you in jail!" The little man did not want to go to jail, so with a heavy heart he paid for the wig and the duck, and then took his way sorrowfully homeward. And knocked it right off from his head, head, head. The little man was so angry at this, and at the laughter of all the men he met, that he traded his gun off for a lawn-mower, and resolved never to go hunting again. He had the little duck he had shot made into a pie, and he and Joan ate it; but he did not enjoy it very much. "This duck cost me twelve dollars," he said to his loving wife, "for that is the sum Johnny Sprigg made me pay; and it 's a very high price for one little duck--do n't you think so, Joan?" 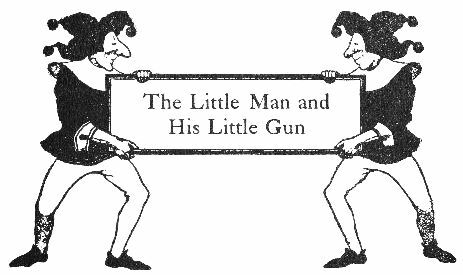 Add The Little Man And His Little Gun to your own personal library.